The Cook's Tour was invited to a special VIP preview of the new ZinBurger that opened in Clifton in December. My review was just published in JerseyBites and I wanted to share it with you. ZinBurger is part of the Fox Restaurant Concepts group from Arizona and ZinBurger is their first step into the northeast market. As you will read in the article, we were impressed with the food, beverages, and service. A well-trained bar staff keeps the waiting crowd happy with a nicely priced selection of wine, beer, and cocktails. On Wednesdays they offer half-price bottles of wine (can't beat that!) and just this week on our second visit, we enjoyed a luscious 2006 Educated Guess cab from Napa. Rich and ripe with juicy black cherry, currants, and cassis with a lingering finish. It's not a large menu, but there are about 8-10 burger selections, including Ahi tuna, turkey, and veggie. The burgers were juicy and flavorful. Four variations of fries (I can personally attest to the delicious hand-cut and the truffle - both thin, crispy, and salty) are offered along with a few good looking salads (but let's be honest - you're here for the burgers). Dessert is limited to shakes, floats, and good old-fashioned pie (pie is the new cupcake). 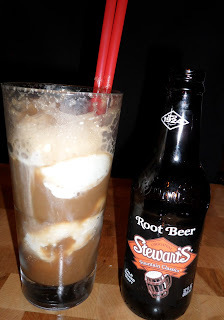 Loved the classic Black Cow Float (vanilla ice cream and Stewart's root beer)! ZinBurger is a welcome addition to the dining scene in northern NJ. Let me know if you've tried ZinBurger or if you have a favorite burger joint.